Sathya Sai Centre Nairobi, Kenya, organized a Gram Seva on the 25th March 2016 in Makindu District in Eastern Kenya. 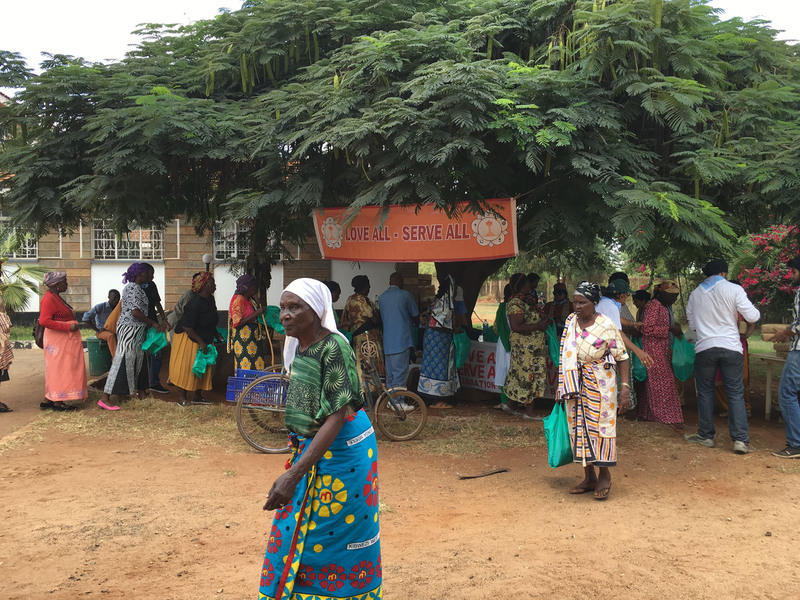 Sathya Sai Volunteers distributed food packages and clothing to 1000 representative heads aged between 50 to 90 years of vulnerable families from four arid villages situated about 200km away east of Nairobi, Kenya. People from these villages are impoverished due to meager or no rainfall at all for successive years and depend on livestock farming under persistent drought conditions. Sathya Sai Centre Nairobi with the assistance of local government authorities could organize for serving these people in the hospital complex of a 100-year-old Sikh Temple in Makindu built by migrant Sikh community members who were employed in laying railway lines in East Africa. The Gram Seva organized during the eve of Easter recess also proved to be an exhibition of communal harmony among different community members who joined hands with Sai volunteers to make the event memorable. Photos of the event can be viewed at this link.